PETS: President -Elect Dana Goba attended. Group 8 now has 9 clubs. Within our group, 7 of the presidents are women. They purchased Rotary tiaras and rocked the training. Brooke Sawyer is one of 5 longstanding Maritime Museum volunteers who will be honored March 15 at the museum. Congrats. Sherri Fisher will retire this summer after 40 years at MTD, having started there as its first woman bus driver. Next week we’ll celebrate St. Patrick’s Day during the meeting. Wear green. Andy Doerr said there will be a Fiddlers’ Convention meeting next Thursday, March 13, at MTD at 5:30 PM. This may be the most important meeting of the year. All are welcome. If you have ideas for the festival, but can’t make it to the meeting, please send your ideas to Andy. The Goleta Valley Arts Association may collaborate with the festival. Steve Kally will lead a hike in Ojai on Saturday, March 8. Bring a water bottle and shoes. “It’s not a death march,” Steve assures you. 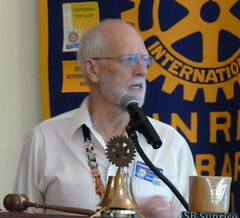 Don Bennett shared that next week’s program will be about polio eradication. 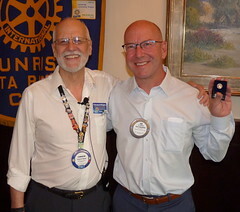 Four individuals and one Rotary couple have kicked off our fundraising campaign with $1,000 each. We have raised $5,000 already! — Mike: Brooke was inspirational in getting the club started. His presidency was short because it started in March. If you sat in the same chair each week, Brook would call people out and tell them to sit somewhere else to keep people mingling and mixing. — Jerry: Brooke started a tradition of singing. They had a Rotary songbook. And no matter which song Brook picked, they would always sing Home on the Range. One time they did a garage sale at La Colina Junior High, and it rained. — Steve: Rotarians are masters of making the not-so-good great. The food wasn’t as good as it is here. They got some pretty bad waffles, so they created a golden waffle award, a solidified waffle in gold. — Fred: The golf tournament started not long after the club. — Brooke: Not only is this club dear to me, but so are five others. He’s happy he hasn’t been thrown out of this one. Getting to know you with Jerry Smith: Who inspired you the most in your life and why? He was inspired by his parents. They set a good example and encouraged him to go after his goals. Pay and tell with Sgt at Arms Andy Doerr. Program:Joanne Schoenfeld Orenstein introduced the speaker, David Petry. He’s a historian, particularly of cemeteries. His most recent book is about the Puritan Ice Company, which played a pivotal role in Santa Barbara’s history. And he will talk about that today. He is also a technical writer at Citrix. 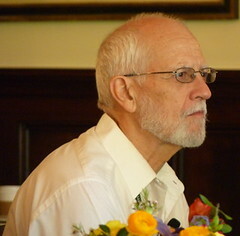 His first book was “The Best Last Place” about the Santa Barbara Cemetery. Part of the necessity for ice was meat. Businesses wanted to ship meat, not whole cows through the Southern Pacific Railroad. Ken Kelley and John Fritsche are part of the history of the history. If you like model trains, you should talk with Ken. Ken wanted an image of the old ice house. John went on a hunt. He pulled in Walter Docker. He later pulled in David. Leon Redner Phillips and Theodore Paul Dalzell teamed up to take on the two big ice producers. The LA lettuce market was at stake. California was divided at about Santa Margarita in 1923. All produce shipped north of Santa Margarita had to go north and all produce shipped from south of that line had to go south, but there was no lettuce produced south of that line. In 1922, they built a 300-ton/day plant with 3,000 tons of storage at 325 Cabrillo Blvd (now Chase palm Park). They made rail and domestic ice. Rail ice is white ice. Domestic ice takes a little longer to get the bubbles out and make it clear. In 1922, they also built a plant in Guadalupe. It was rail ice only. In 1921, no produce was shipped out of that valley. By 1924, more than 5,000 railroad cars were shipped out of there annually. The Scotch-Irish began to move out of Guadalupe and meet the demand in Salinas. Guadalupe became home to many Japanese immigrants. Santa Barbara already had 2 ice companies when Puritan Ice Company came in: Santa Barbara Ice (1874) and Ord “It’s Scored” Ice (1920). When Puritan came in, it undercut them both on price. In 1924, Ord and Puritan merged to form Mission Ice, serving the domestic ice market. In 1925, Puritan bought out Santa Barbara Ice. They expanded both the SB and Guadalupe plants. In 1926, Puritan added an ice and poultry plant in Atascadero. It was the largest poultry plant in the country by 1930. In 1929, they added an ice plant in Lompoc. Many developments came to threaten the ice industry, including refrigerator trucks starting in 1931. Puritan Poultry closed in 1940. The founders died in ’47 and ’58. The new leader formed a leasing company. They bought and later lost two Pepsi distributorships. The end came in 1986ish. In honor of the speaker, 15 dictionaries will be donated to third graders in Santa Barbara.